P.G. 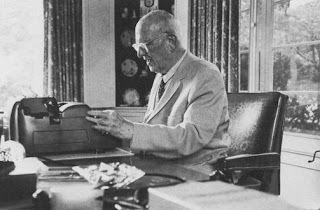 Wodehouse used to write musicals. Indeed, that's where most of his money came from for a long time. He also did us all a favour by writing about writing. Unfortunately, both books (The Performing Flea and the expanded Wodehouse On Wodehouse) seem to be out of print. But I read them so you don't have to. Anyway, when writing musicals the problem for Wodehouse was the performers. Actors may be cattle, but they are vicious cattle. Wodehouse had to accommodate the whims, vanities and contracts of the stars, starlets and gas giants of Broadway. "Why don't I have any good lines in this scene?" they would demand. "I don't even go on in act two." "I demand a huge emotional moment to display my roscian powers." One would imagine that poor Pelham Grenville would have been happy to get back to his novels and short stories. There, alone with his typewriter and his imagination, he would be free. But this was not the case. Wodehouse realised how right the actors were. You simply can't leave a character without a good line. You can't drop somebody half way through a story. Everybody needs a personality or tic. So he would make a point of imagining that he was writing for horrid, vain, demanding actors. He would try to foresee and forestall their complaints and vanities. And the result was the Blandings books and the Jeeves books and the Psmith books and that whole heap of wonderfulness that we read today. Often, Constraint is the doting mother of Invention, whilst Freedom sits among her squalid brood refusing even to change Drivel's nappy. I was going to praise the same quote. It sums up what my Creative Writing classes endeavor to teach. Alfred Hitchcock: "I did not say actors are cattle. I said they are like cattle."